Your fingerprints are formed six months before you are born and no one in the world has fingerprints like yours ! 1. Take one finger at a time and roll it from side to side on the ink pad. 2. Make sure that your finger tip is coated lightly with ink from the top of your finger to the first bend (joint). 3. Place the piece of paper on the edge of a table and roll your inked finger from side to side once. Remove your finger from the paper carefully so that you do not smudge your fingerprint. 4. Do the rest of your fingerprints and take prints of a friends fingerprints. 5. 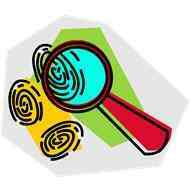 Look at your fingerprints and your friends fingerprints with a magnifying glass. Your fingerprints will be with you for the rest of your life, unchanged. Even if you lose some skin by a scrape or a burn your fingerprint pattern will be there underneath and will grow back. There are several different fingerprint patterns. These patterns are very helpful when taken from a crime scene as they help to identify a person.